Finding the best down pillow is a very individual thing. It's not about the labels or marketing – it's about being comfortable. Pillows are very personal. Few things in life are used more, and held as closely as your pillow. Anyone who has ever carried one around as a child, some longer than others, will understand. The great thing about pillows is that unlike a very big purchase such as a mattress that usually can't accommodate two people with different sleeping preferences, pillows can be mixed and matched with no harm done to the look of your room. 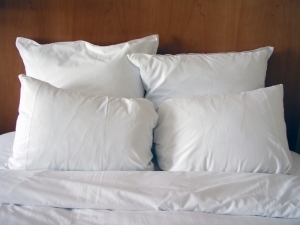 You can either buy different pillow types but in the same size, or buy two pillows for each sleeper. No one will pick up on the differences once they are covered in shams. The extra pillows add a luxurious look to the room, come in handy when reading, or for back suffers to prop under their knees. If they are a bother they can easily be removed at bedtime. Do you really need it? Are you waking up with a stiff neck or headaches. Before blaming your pillow make sure you are positioning the pillow correctly. Your pillow should support your head and neck, not placed under your shoulders. Rather it should rest just above your shoulders. Pillow test: Fluff your down pillow and then fold it in two. If it stays folded it is time to find a replacement. Hold on to your old pillow until you've had the chance to sleep a few nights on your new pillow -- just in case it's not the right one for you. There's nothing worse than buying a new pillow, throwing out the old one, and then spending your nights tossing and turning and wishing you had your old pillow until you find the best down pillow for you. Where do you plan on using the pillow: is it to sleep, or to read in bed. A Down Pillow Travel for home comfort on the go, or on the couch as Down Accent Pillows? Want to sew a down accent pillow insert cover? If you're not sure how, I picked up an easy-to-follow video from You Tube to get you started. Should you go with Goose Down Pillows, feathers, or down and memory foam pillows? Well that depends on the position you sleep in: do you lie flat on your back, turned on your stomach, or curled up on your side? Queen (20 x 30"), King (20 x 36"), or European (26 x 26")? Too many people fit the pillow size with the size of the bed and forfeit a restful night's sleep to aches and pains in the morning. It's a much better idea to match your pillow size with your body, rather than with the size of your bed. How much can you afford: if budget is of no concern to you a Hungarian down pillow will certainly meet and exceed your needs. If you suffer from allergies premium down pillows can reduce symptoms but if you are looking for quality and comfort at reasonable prices Pacific Coast Down Pillows has a wonderful selection of affordable pillows. So now that you have given some thought to how you sleep and what you want from a pillow it's time to take the next step in determining specifically which type is the best down pillow for you. Rest assured that once you've experienced the right down pillow you will be delighted with the comfort and luxury these pillows have to offer! Return from this Best Down Pillow page to the Down Bedding Delights home page.